As a child my dad used to run me through countless footwork drills that I dreaded. It wasn’t until I started running trails and playing tennis as an adult that I understood how important quick feet are to being able to navigate tricky terrain and get to a ball that seems impossibly out of reach. Below are some quick drills you can do to improve your footwork. Use them as warms up before a big match or practice them on your own several times a week. 1.) 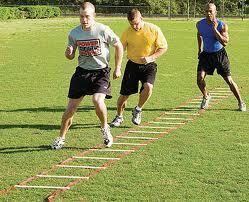 Agility ladder: There are literally 100s of ways to do ladder drills. In my favorite drill, shown in this video, you start at one end of the ladder, bounce on the ball of your left foot into the first square. Bring your right foot to meet your left in the first. Then step quickly into the next square. Repeat this motion to the end of the ladder. Jog to the start point and repeat. You want to go as quickly as you can and stay on the balls of your feet. 2.) Hopping: This is a bit like the childhood game of Hopscotch. Pick a line at least 10 feet long. Stand on one leg and hop back and forth across the line moving from one end to the other. Once you get to the end of the line, turn around, switch feet and go back the direction from which you came. This video shows it done with an agility ladder. 3.) Liners: This one will take you back to your gym days, but it stands as one of my favorite ways to increase cardio capacity and work your lateral muscles, which are heavily used in tennis. 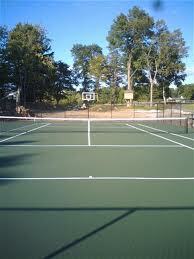 It’s easy to do these on a tennis or basketball court. Start facing the net. Crouch down into a squat with your back flat and your hand touching the double’s line. Quickly shuffle your feet to the single’s line, then back to the double’s line. Repeat this for each line on the court, returning to the double’s line after touching each. You should move quickly, stay lateral and be breathless when you are done. 4.) Diagonal run: Start at the center of the service line. Back pedal as fast as you can diagonally to the double’s line. Sprint to the start. Now back pedal diagonally to the opposite double’s line. Sprint back to the serviceline. Repeat for 1 minute. This guy illustrates it here. Jennifer Aquino is a running coach and fitness instructor. When she’s not chasing balls on the court, she’s running people through drills to help them improve their stamina. She teaches a Conditioning for Running Class on Wednesday nights through the City of San Mateo. She blogs at MothersontheRun.com. This entry was posted in Uncategorized on August 20, 2013 by Jennifer Aquino. Jennifer Aquino is a running coach and fitness instructor. When she's not chasing balls on the court, she's running people through drills to help them improve their stamina. She teaches a Conditioning for Running Class on Wednesday nights through the City of San Mateo. She blogs at MothersontheRun.com.